The village of Arborek is fast rising as a pioneer among the 18 beautiful villages in West Papua that have embarked on developing local regulations for community-based marine conservation, With recently claiming the 1st spot in 2015 Provincial village Competition for West Papua, the village of Arborek has gained an outstanding reputation among both the local authority and international community. With the assistance of the national and local government, from research centers, and non-government organizations, the local people have succeeded in formulating local regulations. With a population of only 197, interaction with locals is a stones throw away from a number of Homestay options available on this island. Finding underwater beauty is not so difficult here. Along the Arborek pier, divers can simply plunge into the water and instantly find a most intriguing illumination of the glittering of a gorgonian fan just below the surface. People in Arborek are hospitable and very industrious, creating exceptional handicrafts from sea pandan leaves to make the most of their time each day. Arborek is fascinating both underwater and in the village. Known as the Arborek Tourism Village, the community is known for its handicraft in making hats and noken (string bags). Unlike most women in other villages who also give a hand to their husbands as fishermen, nearly all mothers in this village produce handicrafts for a living. Although they are convinced that catching lobsters and work in pearl agro-production are much more profitable, yet they feel that handicraft is more distinguished and more graceful work for women. This is a village worth visiting. Only one and half hours from Waisai, Raja Ampat’s capital, the village of Arborek is awaiting visitors from around the world. This tourism village is not too extensive in terms of size. The land covers around a 7-hectare area, so that it will not take much time and energy to travel around the village. There are around 40 families living in the village. Should you stay in the village, walking is probably to only means to be familiar with your holiday destination. For snorkeling, you don’t need to travel far because you can find interesting underwater world even by the Arborek pier. Walking down the village trails will give you the very opportunity you will not want to miss, as people and especially children will warmly greet and get acquainted with you. For diving, it will take about 15-20 minutes by motorized boat to the dive spots. The Arborek Tourism Village is located in MeosMansar in the district of Raja Ampat, West Papua. To reach this location, it is easier to start your journey from Sorong. 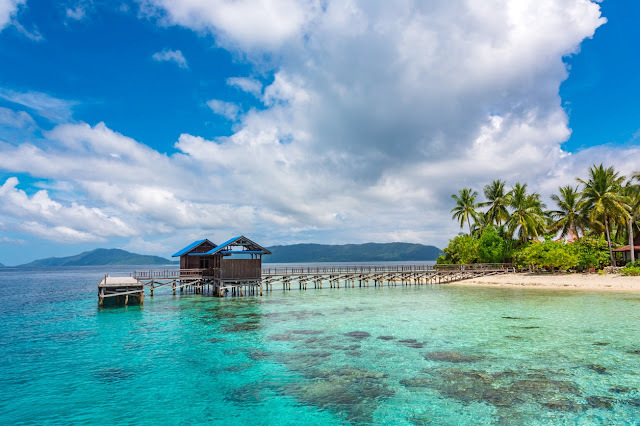 There are several flights that you can take from Jakarta, Bali or Makassar to Sorong. For sea transportation, ships calling on the Port of Sorong are the Dorolonda, the Labobar, GunungDempo, Sinabung, and Tatamailau. From Sorong, you can take a motorboat from the Sorong Fishery Port to Waisai, capital city of the Raja Ampat district. There is a boat from Sorong to Waisai. From Waisai, you can continue your less-than-two-hour journey by using a rented longboat. The longboat can be arranged via homestay or the local dive shop.